I recently completed the new Bloomberg Market Concepts (BMC) course, which provides an introduction to Finance (Economic Indicators, Currencies, Fixed Income and Equities) including assessments, linked to numerous Bloomberg functions. This has improved my technical knowledge as a librarian, meaning I am better prepared to answer research enquiries. A ‘Certificate of Completion’ is available at the end of the self-paced course, which is undertaken at a Bloomberg terminal. In designing a training course to promote the benefits of undertaking BMC to students, this provides an opportunity to meet both a Library and University goal – that of improving student employability. Students can improve their familiarity with Bloomberg, enabling them to better support their research, with data and business news content available to assist in completing assignments. Bloomberg Professional is a financial data and news service, available to current students and staff of The University of Manchester. Training and support is provided by the Business Data Service, part of the Research Services Division within The University of Manchester Library service. See a more detailed post within the Business Research Plus blog. To stand up and deliver a presentation can be a daunting prospect, whether for a new librarian or researcher. Fortunately, we all have access to the most advanced storage and processing unit in the known universe. No, I don’t mean a smartphone and a quick search on the Internet via Google, but your brain. This is spectacularly good at integrating disparate facts, jumping between memories spanning decades of your life experiences and forming connections to apply to a task – such as developing and memorising a training session. You also get additional benefits: creativity and inspiration leading to relevant ideas ‘popping into your head’, often in the middle of the night – you don’t get that courtesy of Google. When I first conducted training sessions as a librarian, assisting in an EndNote course, in combination with another librarian (before going on to deliver on my own) you were left to your own devices to improve (or not). A determination to be better and overcome nerves led me to the techniques described here. Once you have devised a first draft of your presentation dialogue, if on paper, I would then type it up in a Word document, where it can easily be edited and printed. Continue to edit and proofread until you are happy with the content and timing (established by reading aloud to yourself). You are then in a position to develop an Outline – a single page summary of your presentation dialogue to be delivered and memorise the content, using the Peg Rhyme memory technique. I became aware of this technique through a fortunate happenstance – watching a television programme in 1988, entitled After Dark, on Channel 4. This was a late night discussion programme in which a varied group discussed a topic. Appearing in this particular episode was David Berglas, who talked about memory, commenting on another guest’s inability to remember a name (also in the group) and adding that he had just written a book on memory. Being an accomplished magician, he was used to making use of numerous memory techniques and conducting seminars for executives of multinational companies, to improve memory skills. This piqued my interest, as anything which could improve my memory – a useful skill – was worth following up. I therefore purchased a copy of the book, entitled ‘A Question Of Memory’ , which includes many effective, practical memory techniques, such as Peg Rhyme. This technique can be illustrated through an actual Outline for a training session (Bloomberg Certification) I currently deliver to students, which builds on the basic structure of Peg Rhyme. It uses number order (1 to 10) for the sequence linked to something which is familiar (and fixed) – the Peg – which is in turn associated with the item to be remembered. In order to get to this stage I would summarise the dialogue of the training session to Section Headings, Sentences, Phrases, Keywords and Acronyms. 1 – Gun, 2 – Shoe, 3 – Tree, 4 – Door, 5 – Hive, 6 – Sticks, 7 – Heaven, 8 – Gate, 9 – Wine, 10 – Hen. I visualise myself firing a starting Gun – a beginning or ‘introduction’. I visualise gold coins falling into Shoes – from above – valuable – a ‘benefit’. I visualise myself walking into a Tree branch – a ‘L’ow ‘O’bject ‘L’ and ‘O’ remind me of ‘L’earning ‘O’bjectives. I visualise a Door with two rectangular name plates, one above the other. This reminds me of the access screen (two boxes for username and password) when starting Bloomberg, for which you can use a Bloomberg (Bb) Personal Login. I visualise a bee hive, with an image from different BESS function screens (explaining Bloomberg content) on each of the four sides of the bee hive. 6 – STICKS PREPTN. EXAMS. I visualise myself running on stilts (Sticks) and leaping over a pommel horse in my old school gym, where sports went by the abbreviation PE (for Physical Education) which links to ‘P’ for PREPTN. and ‘E’ for EXAMS. I visualise a scene from a film (A Matter of Life and Death – US title: Stairway to Heaven) in which the number of people expected in Heaven is displayed on a piece of paper, which looks like a ‘certificate’. I visualise a large wooden Gate, of the type giving access to a farmer’s field. Part of the gate has a diagonal bar which crosses the horizontal sections, looking similar to a plus [ + ] symbol. At school, addition (2 + 2 = 4) was known as doing ‘sums’, which reminds me of ‘summary’. You need to get familiar with these 10 pegs and consider them visually – linking images. An association doesn’t need to be true, accurate or possible (point six – the image of myself leaping a pommel horse on stilts being physiologically impossible). These visual associations may seem novel, being long-winded to explain, but are instantaneous and reliable in operation – they WORK. The Peg Rhyme structure forms the basis for an Outline. I use a Word document in landscape format, with the title at the top and a date when the document was last updated. With practice, this technique can be used for a number of presentations, with the same keyword to represent similar details. So here, a single keyword has been used to represent an entire paragraph of speech. >75% For example, ‘ > ‘ Greater Than symbol, cuts down space. You may consider it a large leap to be able to speak for 30 (to 60) minutes by memorising the section headings, using the Peg Rhyme technique, from a single page Outline. However, the many small steps in summarising the full text of your presentation progressively (Section Headings, Sentences, Phrases, Keywords, Acronyms) means you are gaining a good familiarity with the dialogue. Additionally, associations related to each Section Heading are helpful. These can be generated by asking yourself the question: what type of information would I expect from a section with this title? For example, in the Introduction, you might expect to talk about the title of the presentation, what will be covered, the format, any practical elements, handouts and how questions would be dealt with. Hence, this gives you a framework to aid recall of the details you would be covering. Mr Gibson was the name of my O’ level chemistry teacher in 1981. One of the useful tips he passed on to the class, in terms of working to become familiar with a topic, was to do ‘a little bit of work at a time, but often’. He noted that he had used this approach to achieve 2nd place in a national chemistry examination and that it had been effective. I concur. In putting this advice to use, I work on my presentation preparation in the library (training room, before opening time) and also at home after work, in front of the mirror. Tapping with a single finger at the surface of a slim, rectangular artefact – think 2001: A Space Odyssey, but much smaller. I always go for option one or three, not owning a smartphone. When preparing for a training session, option three. It is surprising, but you can still work effectively with your Outline printout a few centimetres from your nose, wedged in by the doors, with others in close proximity. So, 15 minutes well-spent, twice a day, commuting. Spacing out your efforts across train, work and home gives you a spread of times throughout the day (i.e. ‘often’) to get familiar with your presentation and makes best use of your time. The key point in improving competence is Practice, before the actual presentation to be delivered. Confidence is boosted and nerves reduced by effectively utilising the Peg Rhyme technique via an Outline to memorise your dialogue. Knowing what you have to say means you don’t fall back on improvisation: getting rid of ‘umm’s or ‘err’s will ensure clarity of expression and understanding for your audience. Indeed. This never fails to raise a smile with myself. Berglas, D. and Playfair, G.L. (1988) A Question Of Memory. London: Jonathan Cape. With September marking the start of a new academic year, Manchester students are making their way into the University’s Main Library, site libraries, and website in increasing numbers. As the new students get to know what’s available to them, I’m minded to refresh my knowledge of some information resources, including those on Research Data Management (RDM). 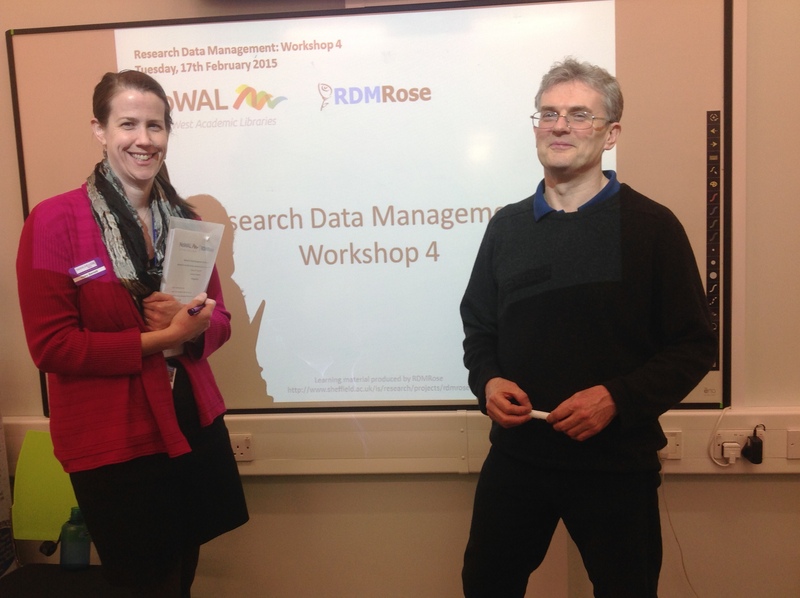 Between November 2014 and February 2015, fellow Manchester RDM Service Team member Chris Gibson and I joined 18 colleagues from NoWAL institutions to participate in a four-day course in RDM that was tailored for information professionals. The course was none other than RDMRose, the result of a JISC-funded project from libraries at the universities of Leeds, Sheffield and York along with Sheffield’s Information School (iSchool), to produce RDM learning materials for teaching and continuing professional development. The course, which met one day a month over four months, was led by Andrew Cox of Sheffield’s iSchool, the RDMRose project director, and ably supported by Eddy Verbaan, one of two research associates on the project. Andrew and Eddy used learning materials that were updated versions of the original RDMRose materials. We met at Manchester, with participants coming from the universities of Central Lancashire and Cumbria, Edge Hill University, Liverpool John Moores University, Nottingham Trent University, University of Salford, and University of Wolverhampton in addition to me and Chris. No two universities are alike, of course, and our conversations through group working and over coffee and lunch exposed us to different sets of experiences relating to RDM. Each day was a mixture of types of sessions, and we were kept working all through the course, designing a support web site and a training program, reviewing sample data management plans, and examining policies for RDM and university repositories, among many other things. Having the sessions spread apart by several weeks allowed us not only to apply our practical takeaways between sessions, but also to do some “homework” (or is it “workwork” if you do it at work?) in order to report back to the group about data management practices at our own universities. Even if you aren’t able to attend RDMRose training, you can still reap the benefits. The most recent version of RDMRose materials (version3) was released in April 2015 and is accessible via the RDMRose website. For those looking to extend their understanding of RDM, it’s well worth having a look – or at least bookmarking for later, once things calm down after the start of year. Want to improve your data skills and know more about statistics? The University of Manchester Library has teamed up with the Cathie Marsh Institute for Social Research (CMIST) to offer a new course. ‘Statistics for Librarians’ will run on March 20 in Manchester.. Participants completing the course will be awarded a CMIST, University of Manchester, Data Skills certificate. Last booking date is this Friday 6 March. For the past year I’ve been involved with the Library’s My Learning Essentials (MLE) Open Training programme, which involves facilitation of workshops on academic and study skills. In addition to the regular offer of sessions on effective academic writing and organisational techniques, January’s sessions include a focus on revision as part of the Library’s Exam Extra offer. 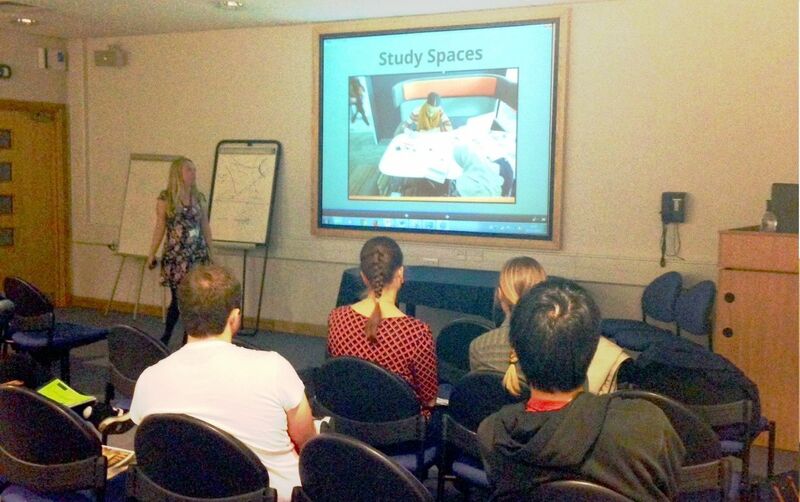 The MLE workshops are used by students and researchers at all stages of their academic careers. Over the last year, 39% of MLE workshop attendees have been Taught Postgraduate students, with Postgraduate Researchers representing 18% of delegates, and Undergraduates making up 38%. I love being able to offer constructive, tangible support to both current researchers and those who may consider further study or research after graduation. The workshop format is intended to make the best use of students’ and researchers’ precious time, with a jam-packed 20-30 minutes of information provision, instruction, discussion and activities. The rest of the hour-long session is left open, so attendees can work alone or in groups, on their own past papers or using example documents provided. There is also the opportunity to talk directly to facilitators like myself for advice. I enjoy being able to work with students 1:1 or in small groups, and discuss resources that can develop their ideas or answer their questions. It’s great to be able to point students to the Library’s fantastic suite of online tutorials. Designed by the Library’s award-winning MLE Development Team, these interactive resources are available for anyone to use, and offer instruction combined with the opportunity to put skills into practice. Some of my colleagues in the Research Services team have contributed to the latest online resource which provides an introduction to statistics. One of my favourite sessions to deliver is Critical Reading, where I suggest ways to ensure that reading is engaged and effective. When setting the agenda at the start of the session I delivered in the first week of January, people attending asked how they could possibly read everything for their topics, or if there was a better way to approach their work. I was able to suggest strategies to determine whether a text is worth reading, through setting a goal on what you wish to get out of a text before you begin, and predicting content and relevance based on title, abstract and introduction. Once you have decided that something is worth reading, I explained the strategies of reflecting on the main ideas being communicated as you are reading, clarifying anything you don’t understand, and summarising the paper and your interpretation of its ideas. As well as checking that you have really understood and engaged with the material, this creates a neat synopsis to refer to throughout your revision, and to look back on for those who go on to further study and research. The most important message I have learnt from delivering MLE sessions, and the one I try to impress upon all workshop attendees, is that whether scribbling a 20-minute exam answer, drafting a 20,000 word dissertation or defending your argument during a viva, we are not tested on what we know, but what we are able to communicate about what we know. The ability to communicate is key to engaging with complex ideas and debates that may have raged for centuries, or are perhaps brand new. I love being part of the MLE Open Training programme which I hope will instil a deeper understanding of methods and approaches to scholarly work, and encourage confidence to challenge and contribute to discussions at all levels of study. Check out MLE resources on the library website. At the start of the new academic year, the Library’s Research Services team has been directly involved in the University Library’s Welcome programme, meeting new students and researchers to explain how to get the most out of the services offered by the Library. With so much for new students to take in, we focused on key information, explaining how to begin using the Library and get started on research. As well as providing logistical information on obtaining student cards and Library PINs, we highlighted the Library’s discovery system, Library Search, and drew attention to the invaluable resources available from the Library. Speaking on 2 October to new Postgraduate Researchers at the School of Mechanical, Aerospace and Civil Engineering (MACE), we described the information, guidance and support offered by the Research Services team on the issues and technology affecting the University’s researchers. 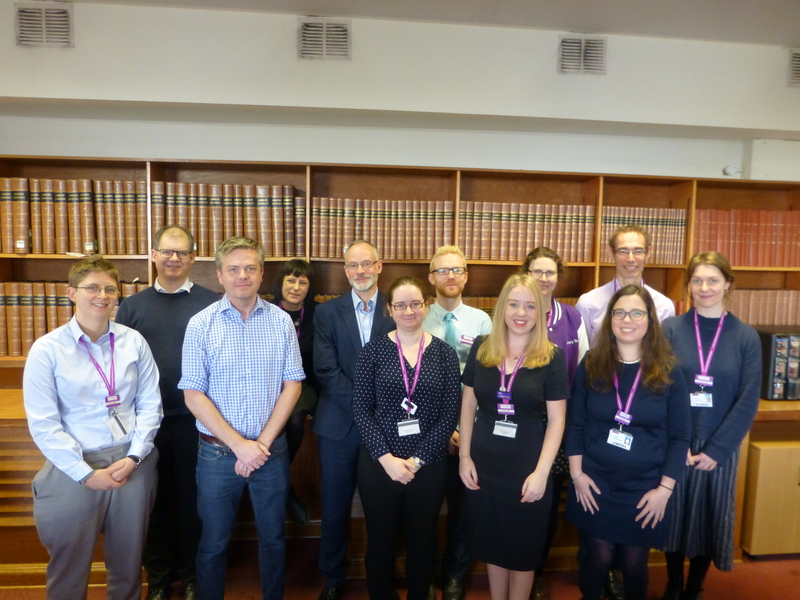 We explained how to get help with Research Data Management; assessing the citation impact of your research; use of our institutional repository Manchester eScholar; and how to make published work Open Access. The Library has developed online Subject Guides to draw together information and resources for particular discipine areas, as well as resources of inter-disciplinary interest like our extensive international newspaper archives. Our colleagues can also support researchers with guidance on copyright, referencing and undertaking systematic reviews. My Learning Essentials (MLE) is the Library’s award-winning skills programme, comprising a comprehensive suite of online resources, workshops and skills clinics designed to help users develop their academic and employability skills. MLE offers a great opportunity to develop essential research skills, hone referencing techniques and the use of referencing software such as EndNote and Mendeley, and learn the most effective ways to plan literature searches. 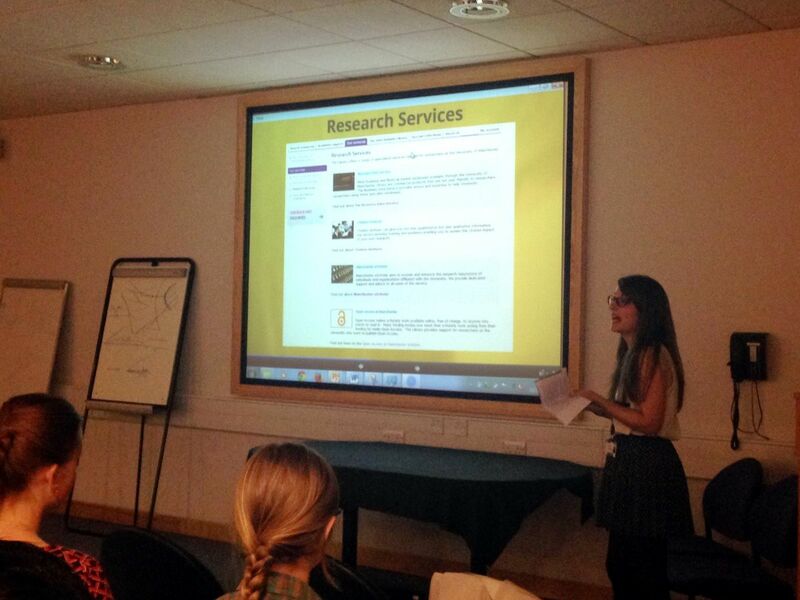 It was great to meet some of our new researchers and we look forward to working with them this year. I have successfully undertaken certification for a number of financial databases over the last three years, which has helped me in my role in the Business Data Service. The certification process involves becoming familiar with content relating to a database. This is represented in a series of videos on which the examination(s) are based. Upon successful completion of the examination(s), a certificate is emailed to the candidate, which can then be added to their curriculum vitae. This article sets out my experiences and thoughts on database certification, comparing and contrasting Bloomberg and Thomson Reuters’ certification schemes. Although the certification process for Bloomberg Professional is commonly known as ‘Bloomberg Certification’, the official title (on the certificate) is ‘Bloomberg Essentials Training Program’. 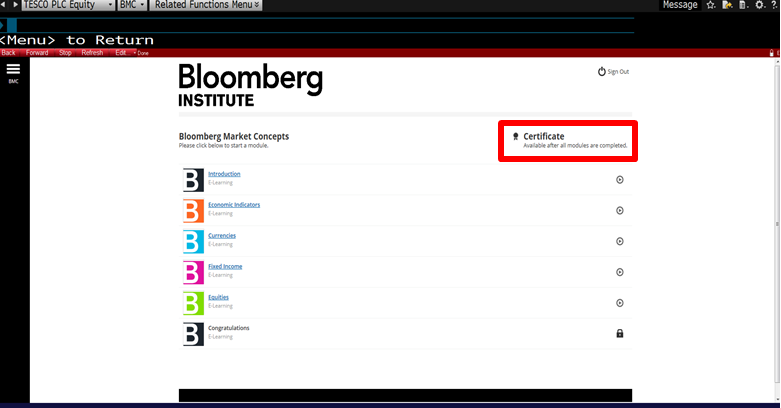 Videos are viewed and examinations taken at a Bloomberg terminal using the BESS [Bloomberg Essentials Online Training Program] function code, and pressing the Enter/GO key to display the screen below. You can then scroll down for the video titles/links (four core, four market sector) and duration. Questions are based on the content within the videos. 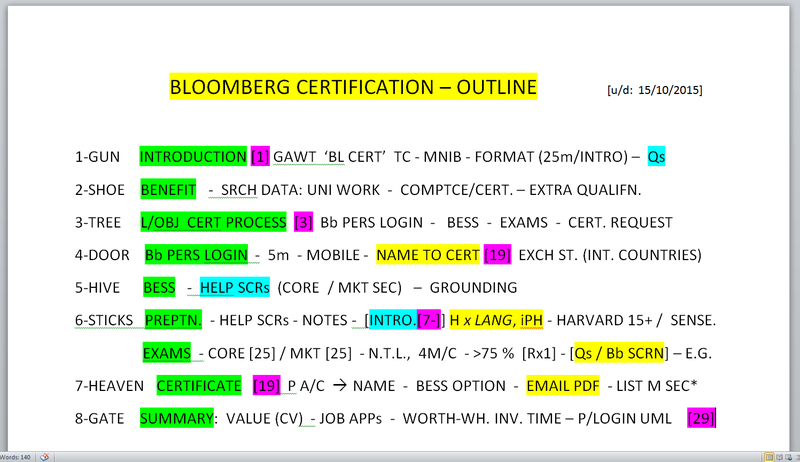 A candidate would need to obtain a Bloomberg Personal Login and use this to login to Bloomberg prior to taking the examinations from the BESS screen. A minimum of two examinations need to be passed (core plus one market sector) to obtain a certificate from the BESS screen. 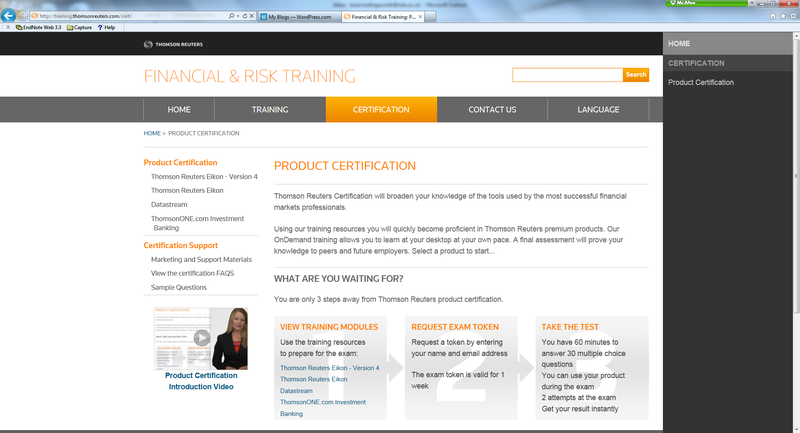 Certification is currently provided in three areas: Datastream, Thomson ONE.com Investment Banking and Eikon. Having undertaken the first two, I will deal with these, which follow the same format. Videos are web based: at Thomson Reuters Product Certification, lasting between one and seven minutes, compared to the 18 to 35 minutes for Bloomberg. No prior knowledge (as with Bloomberg) is required for the c.130 Datastream and c.40 ThomsonONE.com Investment Banking videos. You click on the required option and follow the prompts to view the videos. There is a single examination for each product (e.g. Datastream) with questions based on the content in the videos. As with the training videos, the examination can be taken from any location with web access – so not necessarily in the library. I gave a 30-minute session covering the steps involved in certification for the database in question. Adapting to the reaction of students in the first training sessions, I added an introductory section in the middle, which covers searching and the type of information/data available within each database. This allows students to get an appreciation of the ‘look and feel’ of the product, rather than just concentrating on the key steps in certification. This definitely improved the training and resulted in a more rounded course and better student attention. Employability: an additional qualification which can help to set students apart from other candidates – who may otherwise have very similar qualifications, for which there is no charge. Database overview: certification gives an overview of searching techniques for a database, to enable more effective use of the content available. For example, completing Datastream certification would mean an MSc student on a finance-related course would be fully prepared to search for quantitative data in support of their dissertation. Flexible working: students can progress at their own pace and choose when to take the examination(s). Builds technical knowledge: to improve capabilities when answering student research enquiries. Flexible working: I could progress at my own pace, taking into account other work commitments. This is reflected in my certification completion dates: Bloomberg (November 2011), Datastream (February 2013) and Thomson ONE.com Investment Banking (January 2014). Database promotion: a means to promote the use of Bloomberg and Thomson Reuters databases to students, emphasising the benefits to be had. By providing certification training to guide students and promote success in the certification process, the Library is helping achieve a University goal – to improve the employability of our students. In setting the level of difficulty, Bloomberg and Thomson Reuters have struck the right balance – sufficiently rigorous to be seen as having value by employers, but not so difficult that only a few can pass the examinations. The provision of the certification schemes by Bloomberg and Thomson Reuters is a great benefit and represents a worthwhile investment of time for both students and library staff. For further information, see an extended post on Business Research Plus.